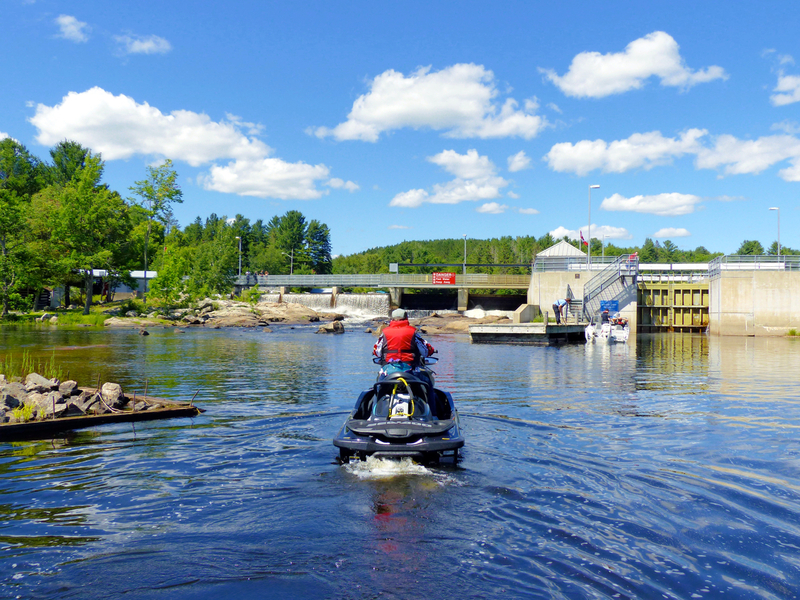 Here’s everything you need to know to plan a Magnetawan River Ontario Sea Doo Tour. 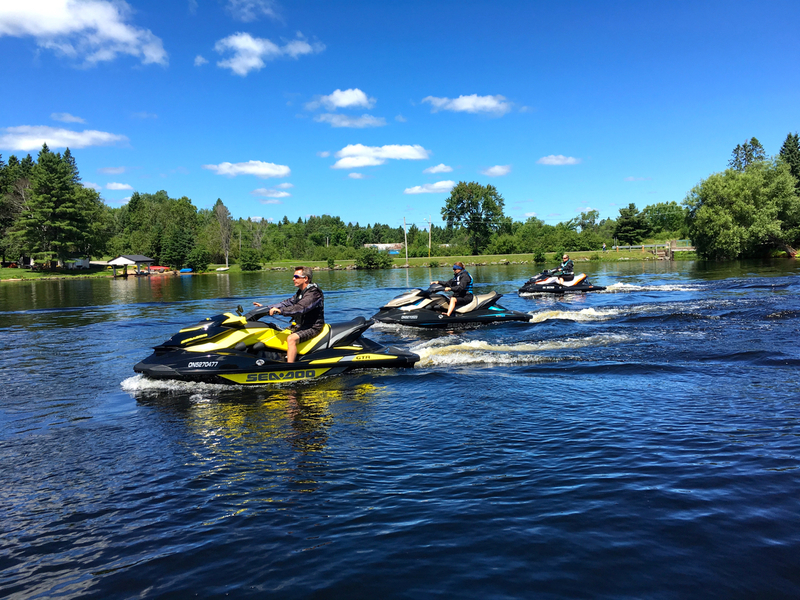 This Sea Doo, jet ski and waverunner personal watercraft adventure is a self-guided, day ride in the Ontario tourism region known as Explorer’s Edge. It starts at Burk’s Falls, where I parked my Triton Trailer and launched my Sea-Doo GTX 155. The town’s located about three hours north of the Greater Toronto Area on Highway 11 at exit 257 on the Magnetawan River, and will soon make my top 10 list of Ontario day rides and best river rides. The Magnetawan River flows about 175 kilometres from its headwaters in Algonquin Park. It empties into Georgian Bay at Britt on Byng Inlet. Known for its white water paddling, the Magnetawan River waterway has numerous rapids and a couple of dams. But it’s navigable by PWC from Burk’s Fall to Ahmic Harbour (positioned at the Magnetawan River waterway’s midpoint). It’s a one-way distance of about 65 kilometres. Interestingly, this is over 20 klicks longer than going by road on Highway 520. If you look at a map, you’ll see that the Magnetawan River meanders along like a piece of string lying on the floor after the cat’s finished playing with it. But it’s the Magnetawan’s twisty-turny course that makes it so much fun to Sea Doo ride. That and its narrow width much of the way make for a memorable river ride experience. Water depth isn’t a concern either. Because this section was well dredged in yesteryear to accommodate the small steamships that carried passengers and mail. So we never spotted any shallows on the main channel of the river itself. There are a few cottages on its shores. But lots of wilderness too. Along the way, the Magnetawan River widens into Lake Cecebe (or is that Cecebe Lake?). And ends at Ahmic Lake, separated at the Town of Magnetawan by a dam. But connected by a good size lock for boats and personal watercraft (see How to Go Through Locks). There are public boat launches both above and below the locks (see How To Launch Safely). Same goes for public docks where Sea Doo riders can moor and walk the few yards into town. You’ll know Magnetawan is close when you spot the Cecebe Lake Lighthouse. It’s visible soon after passing the cliffs of Echo Rock on your port side. Originally built to guide boat traffic, it’s now an historical structure sitting in mid channel. And just east of Lake Cecebe, don’t miss Goose Lake. 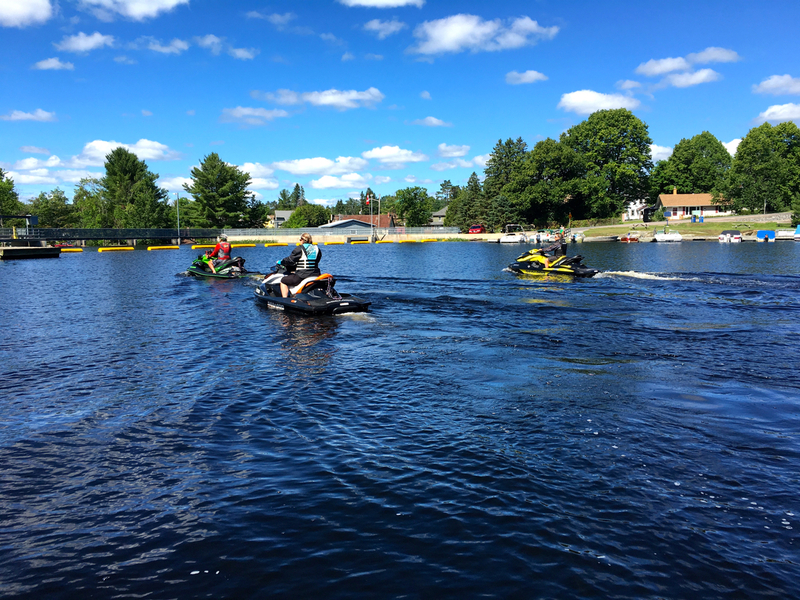 An ideal jet ski playground accessed from the Magnetawan River. If you’re looking to make a Sea Doo riding weekend of it, I recommend one day on the Magnetawan River. And a second day of Sea Doo riding Vernon, Fairy and Peninsula Lakes out of nearby Huntsville, staying overnight in that town for your area Sea Doo tour. Public launch beside the Burk’s Falls Welcome Centre (public washrooms and snack bar – see map). Free launch provides two side-by-side paved ramps, parking (on the grass) and public docks. None on the water, but fuel in town and Tim Horton’s at Exit 257. Magnetawan Grill & Grocery, Ice Cream and Burger Stand (access both from nearby public docks), fuel at Ahmic Marine. 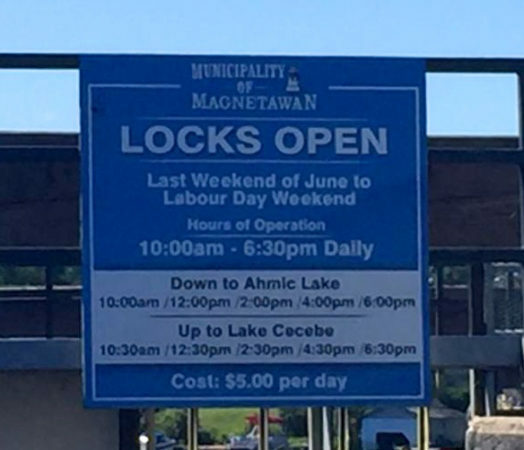 As you can see, the lock dates and times are somewhat limited at the Magnetawan Lock. This isn’t unsurmountable if you plan ahead to arrive just before one of the posted lock thru times. This will give you about two hours to explore Ahmic Lake and have lunch before the return lock thru is available. Swiss Country House Restaurant, fuel at Ahmic Lake Resort – access both from nearby docks. Like this ride? Check out my other Sea-Doo Rides! Riders should reconfirm the Sea Doo tours routes and services mentioned in this article as they may have changed since publication. Any map is for reference only and any marked lines or locations are not intended as an exact or accurate depiction of positions.